When people ask, “Exactly what is SFG?” we tend to give them a rather long explanation of how simple and easy, how economical, how green it is using a lot of fancy words. But if we could show them the drawing above it would illustrate that old definition of a picture: it’s worth a thousand words. This graphic truly is worth a thousand words. 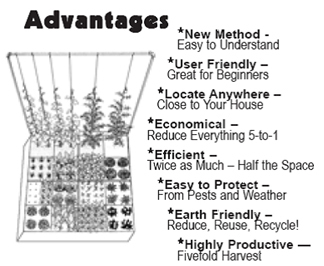 If you’d like a little longer explanation and you have already seen the chart to the right about the advantages then I could add that building a box keeps your garden neat and tidy. Filling it with Mel’s Mix gives you the most perfect soil with no weed seeds and can even be taken with you when you move. Adding a grid is actually the most important thing a beginner must learn. We like to say, “Without a grid, you do not have a Square Foot Garden.” As you continue gaining experience with your SFG, you will understand how important the grid is for locating your plants and spacing them properly. Planting and replanting becomes such a simple thing. Besides that, your garden is going to be very attractive. Picture now a different crop in every single square foot. There will be vegetables in some, flowers in others and even herbs included in your SFG. It becomes a beautiful and very attractive garden. I’ve taken this question and answered in my latest Dear Mel column. Hope you enjoy. Hi Mel. I’ve been searching all over your site for a definition or explanation of what SFG is. This post covering a list of benefits is intriguing but i can’t work out what its all about. Thanks in advance, maple. I can see what you mean by searching for a clear, understandable definition of what SFG is, so I’m going to make some changes in our website, all from your letter and thank you for writing it. First of all, and I’m not sure this is on the website but I’m going to have my people look and see, in addition to the benefits and the general description which I know is on the website in the Garden Tips or trifold and that can be downloaded and printed out. Here is a direct link to that. But it says a simple, unique and versatile system that adapts to all levels of experience, physical ability and geographical location. Grow all you want and need in only 20% of the space of a conventional row garden. Save time, work, money, and of course that’s just a lot of words and I suppose it really could apply to almost anything if you use your imagination. What we need to do is to make sure that there are two things that will tell you exactly what is Square Foot Gardening in very simple terms. The first is the three steps. And, with a little bit of graphics, it’s just: 1. Build a box, 2. Fill it with Mel’s Mix, 3. Add a grid and start planting. It’s all that simple. Then if you go back to the same tri-fold, the ten basics of Square Foot Gardening, you’ll see how this ties in with steps one two and three. Build a box, it tells you about layout, think in squares – not in rows. Build your boxes, and in the book it shows that adults are four by four basic size, children are three by three. Then the other basic principle is to leave three foot wide aisles between the boxes so you can walk and tend to your boxes without stepping on your growing soil like in row gardening. So that is building the box, and of course the book is filled with pictures and how to build the box. The next step is to fill it with Mel’s mix. If we go to the ten basics, number four is soil, it gives you the ingredients. And the book is filled with page after page of where to get the ingredients, how to mix them and all that sort of thing. And the next thing is add a grid that is number five of the ten basics. And the book tells you all different kinds of materials to use for the grids and how to put them on. And the next step is start planting. So basically all you’re going to do is build some boxes, lay them on top of your existing soil, lay down a weed fabric so that weeds will not come up into your garden from your existing soil. Remember now, suddenly you realize we don’t use existing soil that means we don’t have to dig it up. That means you don’t need any tools. That means you don’t need to know anything about your existing soil. We don’t care what kind of pH it has or what the NPK of it is, because we aren’t going to use it.We don’t even have to learn what NPK is! Isn’t that easy? Next step is to fill it with Mel’s mix. So if you have a perfect soil you don’t even have to know about what plants need from existing soils. It would be like building a large window box and you go to the nursery and you buy a bag of good potting soil. Pour it in the wooden window box and you start planting and you don’t care what your existing soil is; that’s how easy Square Foot Gardening is for your back yard. Remember under the ten basic steps: number seven is plant a different crop in each square foot. The next one is how to water. And we save seeds by just putting a pinch in instead of a whole package. There is no thinning involved so it reduces the work and the cost. The next step is watering. We don’t water overhead, you either drip irrigation or you hand water each plant. The book describes that in great detail. The last step is how to harvest and then replant. So I go back to the simplest explanation is build a box, fill it with Mel’s mix, add a grid and start planting. The details are what size box, what kind of material you use, how big it should be, how deep it should be, and where it should be. In the tri-fold, you’ll see right below the ten basics, the location, tips on where to locate your garden. It no longer has to be way out back because gardens aren’t that big anymore, not with Square Foot Gardening, and it can be right near your back door. That means you’re going to tend it more often, you’re going to make better use of it, and you’re going to enjoy it more. Maple, that’s a long answer to a short question. I think the best thing we can do is make more use in our website and in our literature about the three steps. 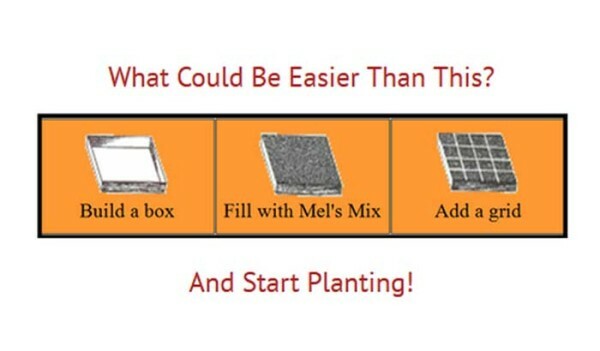 Build a box, fill it with Mel’s Mix, add a grid, and start planting. And really, Square Foot Gardening is truly that simple and easy. There is so little you really have to know because you’re starting with everything perfect. Perfect soil, perfect location, perfect planting method, and you’ll have a perfect harvest. Thank you so much for your letter. It shows me that we’ve sometimes oversimplify a complicated answer and sometimes we complicate a very simple answer. So I’m going to try to do better in the future, and then add all the other things we do. Be sure to check out our forum and our front yard garden contest to get more involved with SFG!